Chemists spend a lot of time with chemicals they’re trying to identify. Some chemists try to figure out what’s in that bottle that Uncle Merle had in the “lab” out in the back shed, while others try to figure out whether EvilCorp was dumping toxic waste directly into the mouths of endangered squirrels. Whichever is the case with you, it’s handy to have some method around to identify those pesky unidentified chemicals that are lying around. Let’s have a look at some of the more common ways that people use to figure out what the heck it is they have sitting in their lab. 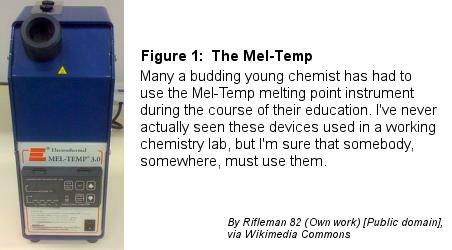 Melting point: If you’ve got very pure crystals, you can use their melting point to figure out which of several possible chemicals you’ve got. Color: This is a really rough tool for figuring out what you’ve got. Generally speaking, this is used to figure out if you’re doing the right thing (i.e. if the product is supposed to be blue and you see blue, you can keep going), but not for identification. 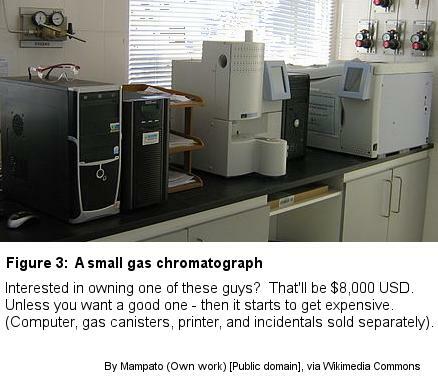 Chromatography is used by basically everybody when doing experiments. Of course, that’s actually not a very clear statement, given that there are about a billion different types of chromatography, but technically true. By measuring the amount of time it takes for each component to come out the other end of the tube, you can figure out what it is. A disclaimer: Chromatography has absolutely no ability to definitively identify anything. It gives no information about chemical structure or anything else. However, if you have a pretty clear idea of what’s in the mixture, or if you’re monitoring the progress of a reaction, you can usually infer the information you want. Interested in some examples of chromatography? Here goes! Column chromatography: A vertical column is filled with silica gel and solvent, then the mixture is placed on the top and the components pass through to the other end at a time dependent on how attracted they are to the mobile phase. 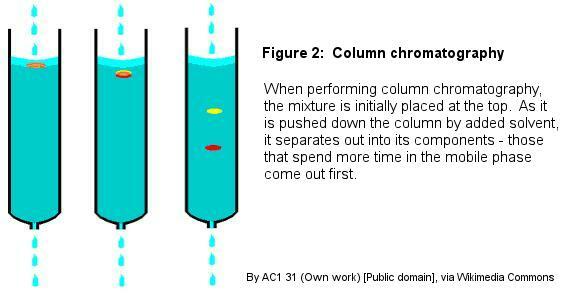 Column chromatography is usually used to separate the components of a mixture during purification. Thin layer chromatography (TLC): Pretty much the same thing as column chromatography, except that a small spot of the mixture is placed very close to the bottom of a glass plate covered with silica gel, and capillary action pulls the mixture to the top. Commonly used to determine whether a reaction is complete. Gas chromatography (GC): A very long tube full of stationary phase stuff (usually a polymer of some kind) has an inert gas (nitrogen, argon, helium) passed from one end to the other. At time = 0, the mixture is injected into the front and a detector determines when each component comes out the end. Very commonly used mass spectrometry (MS). High performance liquid chromatography (HPLC): Very similar to GC, except that the mobile phase is a liquid. Gel electrophoresis: Different nucleic acids (i.e. those things in proteins and stuff) can have their electric charge manipulated via pH. By passing an electric current through a dish containing small amounts of these acids at one end, those with more charge will travel farther in a given time than those with less charge. Used extensively in biochemistry. 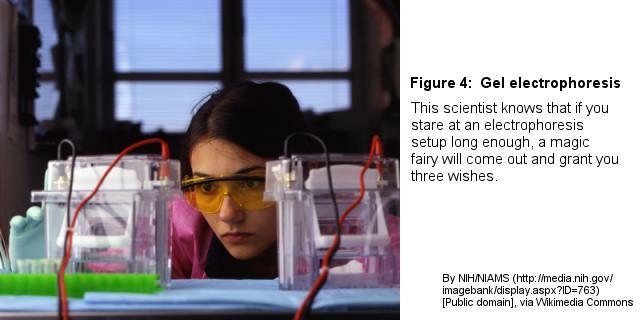 Spectroscopy: Hope you’ve got good funding! If you’ve got some money to burn, you now have access to some more awesome tools for identifying stuff. Which is to say, you can now buy yourself a spectrometer and do some spectroscopy. If you think back to when I talked about the Bohr model of the atom, you’ll remember that I mentioned how all of this worked already. Of course, since you don’t feel like looking it up, I’ll just tell you again. Step 1: Add energy to your sample. Step 2: This will cause something in the sample to go from a lower energy ground state into a higher energy excited state. Step 3: When the sample reverts to the lower energy ground state, the energy that it absorbed will be given off. Because everything has different energies at which this happens, you can use this unique spectrum to figure out what the sample is. In a very simple example, this is something you can do in a simple lab using the “flame test”. When samples are heated over a Bunsen burner, they turn different colors, reflecting their spectra. While of limited use in the real world due to the huge number of elements out there, it gives you an idea of how this works. UV-vis spectroscopy: In this process, the light you hit the sample with is, unsurprisingly, in the ultraviolet and visible part of the spectrum. This causes electrons to jump from a ground state to an excited state, and the light that’s emitted is the spectrum that you measure. IR spectroscopy: Using the infrared part of the spectrum, IR spectroscopy measures vibrational transitions. As it turns out, molecules vibrate in a bunch of different ways, and some have more energy than others. When you hit the sample with IR radiation, you go from a ground vibrational state to an excited one, and IR radiation is given off when it returns to the ground state. Though you’ll see ancient IR spectrometers in some lower-level labs, most scientists use way the more expensive FTIR (Fourier transform infrared spectrometry). Related to IR spectroscopy is Raman spectroscopy, though you probably won’t see it much. 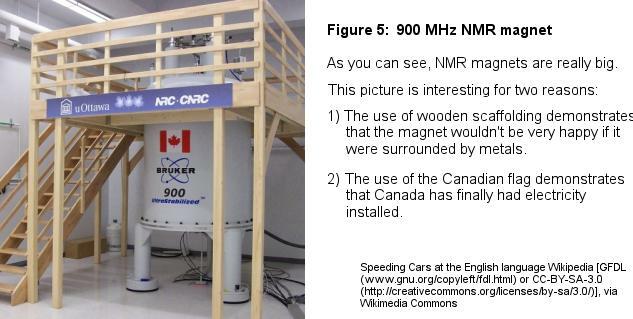 NMR spectroscopy: The NMR in this method stands for “nuclear magnetic resonance”, and if you really have a lot of money burning a hole in your pocket, you’ll get one of these. In NMR spectroscopy, a sample is placed into a giant magnet⁶ which aligns the spins of all of the nuclei (usually hydrogen-1 nuclei) in one direction⁷. After they’re all comfy and cozy, the sample is hit with an unbelievably strong pulse of radio frequency radiation, which causes the nuclei to all line up in the other direction. The amount of time it takes for the nuclei to return to their original alignment is measured, and because all atoms are in different chemical environments you can get some info about what the molecule looks like. In the medical field, an NMR spectrometer is called an MRI machine (for magnetic resonance imaging) and is very expensive to use (especially if you don’t have insurance). If you’ve got a solid sample and want to know its structure, it’s possible to shoot X-rays at it to figure it out. Basically, the X-rays will diffract into various patterns depending on the structure of the sample, and with the use of high-powered computers you can figure out exactly what it is you’re looking at. It’s usually not used to identify an unknown substance, but to figure out the long-range structures of known materials. If you have a protein and want to know how it folds, or if you want to know what the structure of a crystal is, this will do the job. Simple chemical tests can be used to identify the presence of various elements or classes of molecules (Tollen’s test). Gravimetric analysis: You use the change in mass during an experiment to figure out what you’ve got. For example, by heating a hydrate you can figure how much water was present. Titration: This process typically uses the neutralization of one compound with another to determine the concentration of the unknown. While acid-base titrations are the ones most-commonly seen, there are other types, too. Electron spin resonance (ESR): Also referred to as electron paramagnetic resonance (EPR), this method uses the spins of unpaired electrons in molecules to determine structure. The method for this is similar to NMR, but I figured I’d put it in a separate section because it’s sufficiently odd that you probably won’t see it much. Most molecules don’t have unpaired electrons, which makes ESR a little less useful than other methods. For more information about this license and how it affects how you can use the contents of this site, click here. For those of you who need to cite this using incorrect methods such as MLA, APA, and Turabian, it was written by Ian Guch on October 28, 2014. If you’d like to cite this page correctly using ACS style, click here. 1. When I was learning how to be a chemist, smelling the solvents was extremely common. Unfortunately, it didn’t occur to us that it might not be a great idea to smell toxic chemicals (and nearly all common solvents are, to some degree, toxic). I’m pretty sure I could identify methylene cloride at a hundred paces, despite possible central nervous system damage. 2. It’s funny what you find in high school chemistry labs. It seems that many of the people who come up with the educational standards that teachers are supposed to use have no knowledge of post-1950s chemistry, which explains why you have to learn about empirical formulas and combustion analysis. 3. Actually, it can be a sheet (as in thin layer chromatography) or a tub of gel (as in gel chromatography) or probably about a million other things I could mention. I’m using a tube to make my point, though, so go back and read the important stuff. 4. Again, this describes mainly processes such as gas chromatography or high performance liquid chromatography. The method is different for TLC and column chromatography (as well as others I don’t feel like typing out), but the idea is the same. 5. The tendency of a chemical to do this is called its “retardation factor.” (Retarded, in this case, is used literally in the sense of “held back.”) In chromatographic methods where the process is stopped before everything comes out the end (TLC, gel), this term is usually referred to as the “retention factor”. 6. These magnets all utilize superconductivity to get extremely powerful magnetic fields. As a result, you can permanently stick staplers to the magnets, causing the very upset NMR technician to brain you with a chair (a stapler will screw up the spectrum). Additionally, electronics such as pacemakers will do very badly in this sort of magnetic field, so if you’re in a hospital, take those warnings seriously. 7. Other isotopes can also be used, provided that they have a spin of 1/2. The most common of these is carbon-13. Because these other isotopes are less abundant than hydrogen-1, it takes longer to obtain NMR spectra for them. 8. The Spec-20 was discontinued in 2011 after having been sold for 58 years. However, it’s pretty safe to say that, given the expense of buying new equipment as well as the effectiveness and durability of the Spec-20, you’ll be seeing them around for a long time. 9. To understand why big particles don’t turn as quickly as small ones, imagine a race in which a skinny guy and a fat guy have to make a 90 degree turn. Though both may be running the same speed, the fat guy will take longer to make the turn because it has more energy than the skinny one (energy is proportional to mass, if velocity is the same). 10. This figure simplifies a few things for clarity. For example, the mass isn’t measured directly, but rather the m/z ratio, which is the mass of the particle divided by its positive charge. If the charge is +1, this will be the same as the mass, but it won’t be if there is more than one electron removed in the ionizer. Additionally, there are spectrometers referred to as “time of flight” spectrometers in which the particles aren’t separated by how far apart they are on a graph, but on how long it takes for them to hit the detector. It works by the same principles, though the implementation is different. 11. It’s theoretically possible to use really fancy computations to figure out the structure of a liquid or powder, but not realistic in practice. There is a process called small-angle scattering (SAS) that does this a little better, but again, it’s not usually used to identify unknowns.